Hey hey! 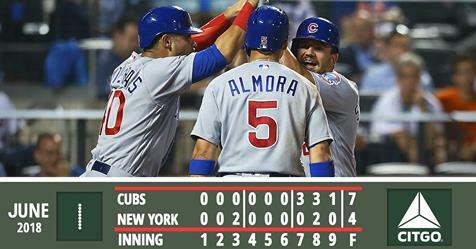 The Comeback Cubs continued their road trip roll on Friday night, overcoming a 2-0 deficit to beat the Mets 7-4. 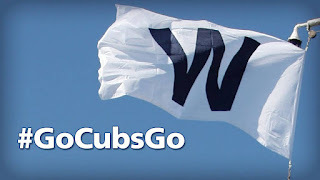 All seven Cub runs came in the final three innings, and Chicago pounded out 17 hits en route to the win. Kyle Schwarber's sacrifice fly put the Cubs on the board in the 7th, and his three-run homer in the 8th put the game out of reach. Ben Zobrist, Addison Russell, Albert Almora, and Kris Bryant each had three-hit nights, and Almora's night put his batting average at fifth-best in the NL among qualifiers. That's Cub. The series continues Saturday at Citi Field.